Acute kidney injury (AKI) is associated with high morbidity and mortality, and early recognition is important. This article discusses the management of AKI in primary care with a focus on medicines optimisation, and describes when referral is necessary. Acute kidney injury (AKI) is defined as any rapid loss of kidney function. It is characterised by the retention of nitrogenous (urea and creatinine) and non-nitrogenous waste products, and disordered regulation of fluid, electrolytes and acid-base balance. The term AKI covers a spectrum of conditions, from minor changes in urine output and blood results to kidney failure requiring renal replacement therapy. Evidence suggests that even relatively small changes in kidney function may be associated with poor patient outcomes,1 thus AKI has replaced the older and narrower concept of ‘acute renal failure’ in clinical practice. Updated definitions and diagnostic criteria for AKI achieved widespread usage concurrently with an increased focus on AKI by healthcare institutions. In 2009, the National Confidential Enquiry into Patient Outcome and Death (NCEPOD) published Acute Kidney Injury: Adding Insult to Injury.2 This report recognised that AKI is a common problem often caused by systemic deficiencies in care and giving rise to significant healthcare costs. Following the publication of the NCEPOD report, NICE developed a guideline (CG169) for the prevention, detection and management of AKI, which was first published in August 2013.3 More recently, a UK-wide programme supported both by the NHS and independent funding bodies, Think Kidneys, has sought to raise awareness of kidney health with separate strands focusing on both AKI and chronic kidney disease (CKD). Approximately 15–20% of patients admitted to hospital may have AKI,5 and community-acquired AKI may affect younger patients and be more severe.6 As a result, AKI may have the potential to act as a barometer of safety in patient care delivered across the interfaces between primary and secondary care. AKI frequently complicates acute illnesses such as sepsis and conditions that result in hypovolaemia. The co-existence of common medical problems with acute illness may increase the risk of patients acquiring AKI (see Table 1). Patients presenting with acute illness and any of the risk factors listed in Table 1 should be assessed for AKI. In secondary care, AKI is assessed by measurement of serum creatinine and comparison to baseline. However, in primary care, the requirement for blood tests will be dictated by clinical circumstances. For example, where there is evidence of sepsis, urgent transfer to an emergency department is the priority. Alternatively, measurement of serum creatinine may not be required for patients with an apparent self-limiting acute illness. Between these two extremes, priority of serum creatinine testing should be given to those patients with the co-existing illnesses shown in Table 1. 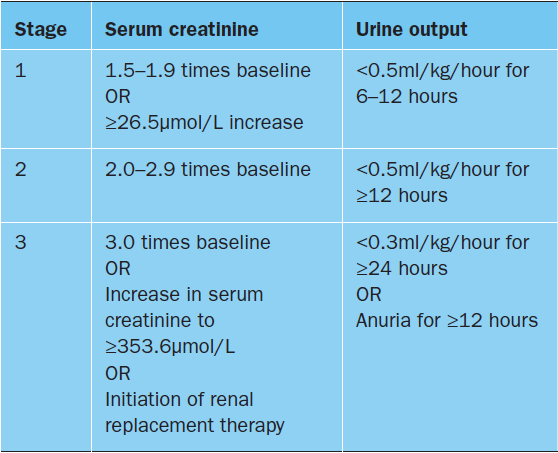 The current diagnostic criteria for AKI are shown in Table 2.7 As can be seen, diagnosis of AKI is based on an increase in a patient’s serum creatinine and/or fall in urine output. These diagnostic criteria do not include estimated glomerular filtration rate (eGFR), which is calculated from one of various available formulae that all utilise serum creatinine measurements. This is notably different from the current approach to the diagnosis and staging of CKD in the UK, which is based on eGFR values.8 Equations used to calculate eGFR were originally derived from patients with CKD without acute illnesses and therefore do not take into account the rapid changes in serum creatinine seen in patients with AKI. The diagnosis and severity staging of AKI (see Table 3) requires comparison with a baseline serum creatinine reading. There is no standard definition of baseline creatinine, but for each patient this is regarded as the stable creatinine value before they had AKI. Calculated values of baseline creatinine are of little use in the diagnosis of AKI.9 As a result, it is crucial for clinicians to seek out and use true baseline creatinine measurements. Sometimes this requires going back through notes or electronic records to establish the last lowest and stable value. Where previous measurements of creatinine are not available, admission serum creatinine should be used as a baseline in patients admitted to hospital. Where possible, the cause of AKI should be promptly determined. It is estimated that approximately 70% of cases of AKI involve sepsis and hypotension11 and therefore many causes of AKI can be elucidated on standard clinical assessment. Medicines are also common causes of AKI, and detection or suspicion of AKI should prompt a full review of all prescribed, over-the-counter, herbal or complementary medicines, as well as use of ‘recreational’ substances, for each patient. Up to 10% of AKI may be due to obstruction.12 Therefore, symptoms of lower urinary tract obstruction or renal colic should be asked about specifically to guide further investigation. Where no clear acute illness is present but AKI is diagnosed, it is important to consider less common causes such as myeloma or systemic vasculitis. The ‘3Hs and 3Rs’ (haemoptysis, haemolysis, hypercalcaemia, rash, recent vascular intervention, raised creatine kinase)13 are a useful screening tool for uncommon causes of AKI, and the presence of any of these together with a raised creatinine should prompt referral to secondary care (see Table 4). Dipstick urinalysis for blood, protein, leucocytes, nitrites and glucose is a mandatory investigation in AKI. The presence of dipstick abnormalities is often sensitive but not necessarily specific, and AKI often occurs with a normal dipstick analysis. Patients with urinary catheters or a urological history (eg ureteric stents or chronic cystitis) may have chronically abnormal dipstick results. On the other hand, patients with volume depletion alone will often have a normal dipstick result. Large amounts of blood and protein (2+ or greater) on dipstick urinalysis without another obvious cause for AKI should raise the possibility of a diagnosis of glomerulonephritis, and necessitate urgent referral to nephrology services. Additional diagnostic testing may include urinary tract ultrasonography. It may not be necessary to obtain an ultrasound if the cause of AKI is obvious, eg profound volume depletion. However, if symptoms and assessment suggest an obstructed and infected kidney in the presence of AKI (eg known stone disease, fevers, loin pain, solitary kidney) then ultrasound scanning should be performed within six hours.3 Where no obvious cause is found for AKI then ultrasound scanning should be performed within 24 hours. Ultrasonography is particularly important in patients who do not present with an acute illness or AKI risk factors (see Table 1), as these patients may have urological obstruction. Asking about new or worsening urological symptoms may suggest this as a cause for AKI. Many different causes of AKI exist, so management will vary from patient to patient. For example, where urinary retention is present, or ultrasound scanning reveals upper urinary tract obstruction (ie hydronephrosis), the focus of management will be urological relief of obstruction. Some patients will develop stage 3 AKI (see Table 3) and require renal replacement therapy (RRT). Indications for RRT include hyperkalaemia, metabolic acidosis, fluid overload, pulmonary oedema, and symptoms of uraemia (eg encephalopathy). Patients with these complications of AKI, regardless of the cause, should be immediately discussed with nephrology or critical care3 to ensure rapid transfer of care to the correct specialists during their emergency hospital admission (see Table 4). In the majority of cases of stage 2 or 3 AKI, all of these medicines should be suspended. In addition, some medicines, eg metformin, sulfonylureas, antibiotics and opiates, may accumulate in AKI and lead to harmful side-effects. The Think Kidneys programme has recently published guidance on ‘sick day rules’ for patients at risk of AKI. The antihypertensives and oral hypoglycaemic medicines listed above are commonly prescribed to patients with diabetes, CKD and heart failure, which all increase the risk of AKI (see Table 1). Furthermore, patients with CKD and diabetes may be treated to a more aggressive blood pressure target of <130/80mmHg8 thus increasing the risk of hypoperfusion of the kidneys and subsequent AKI. ‘Sick day rules’ suggest that patients should temporarily discontinue drugs such as NSAIDs, ACE inhibitors, ARBs, diuretics, metformin, sulfonylureas and trimethoprim during periods of acute illness such as vomiting, diarrhoea, fevers or sweats. The appropriateness of using ‘sick day rules’ in all patients on relevant medicines remains a topic of debate and the Think Kidneys programme has acknowledged that the evidence for reduction of harm in association with this initiative is “very weak”.14 As a result, where patients are deemed to be at high risk for AKI, the key may be to focus counselling both on cessation when unwell but also restarting medicines when well in order to avoid suboptimal treatment of medical conditions after an acute illness. One final consideration for optimisation of medicines is that the antibiotic trimethoprim and the H2-receptor antagonists ranitidine and cimetidine reduce creatinine secretion into the tubules of the kidney and may increase serum creatinine without truly reducing kidney function. This may confuse interpretation of serum creatinine measurements and lead to false positive diagnoses of AKI. A clue is often that the plasma urea concentration is relatively unchanged compared with the creatinine levels. Many patients with AKI may be appropriate for referral to hospital acute services such as the emergency department or acute medicine for assessment and management of co-existent and causative acute illnesses such as sepsis. NICE guideline CG169 contains recommendations for when a specific referral to nephrology is appropriate in AKI.3 Clearly, where indications for RRT are met, this requires immediate referral to nephrology or critical care services. CG169 suggests referral to or discussion with a nephrologist within 24 hours in a number of situations and these are summarised in Table 4. Local arrangements to meet this 24-hour recommendation will vary by region and may include telephone and email advice, dedicated ‘hot’ clinics or prespecified arrangements that use general acute medicine services. When AKI has resolved, it is important to ensure appropriate follow-up and patient education. Some responsibilities, such as discussion of the risk of recurrent AKI, and the potential causative role of dehydrating illnesses and nephrotoxic drugs such as NSAIDs, will be shared by primary and secondary care. Monitoring of kidney function after an episode of AKI will depend on the underlying cause. In the absence of a specialist diagnosis such as glomerulonephritis, monitoring should be carried out as per NICE guidance on CKD.7 Briefly, patients with an eGFR >45ml/min/1.73m2 can be reviewed at least annually, unless they have significant proteinuria. Patients with an eGFR of between 30 and 44ml/min/1.73m2 should be reviewed twice yearly or more, and patients with an eGFR of below 30ml/min/1.73m2 should be considered for outpatient referral to a nephrologist. More generally, data indicate that following an episode of AKI, patients may be at increased risk of mortality, development or progression of CKD and readmission to hospital,6 suggesting that an episode of AKI may imply vulnerability, and patient care may need to be individualised to address this. AKI is common in both community and hospital settings, and is associated with high morbidity, mortality and healthcare costs. Early recognition and potential prevention of AKI may be associated with improved patient outcomes. Patients who are at high risk of AKI should be educated about action they can take themselves to detect and reduce the severity of future AKI episodes. While the spectrum of disease described by the term AKI is broad, increased understanding of its association with acute illness, as well as the patient benefits associated with optimisation of relevant medicines, has the potential to transform management of this condition and remove the “insult from the injury”. 1. Hoste EA, et al. RIFLE criteria for acute kidney injury are associated with hospital mortality in critically ill patients: a cohort analysis. Crit Care 2006;10(3):R73. 4. Guthrie B, et al. Adapting guidelines to take account of multimorbidity. BMJ 2012;345:e6341. 5. Ali T, et al. Incidence and outcomes in acute kidney injury: a comprehensive population-based study. J Am Soc Nephrol 2007;18(4):1292–8. 6. Wonnacott A, et al. Epidemiology and outcomes in community-acquired versus hospital-acquired AKI. Clin J Am Soc Nephrol 2014;9(6):1007–14. 9. Gaiao S, Cruz D. Baseline creatinine to define acute kidney injury: is there any consensus? Nephrol Dial Transplant 2010;25(12):3812–4. 11. Mehta R, et al. Spectrum of acute renal failure in the intensive care unit: the PICARD experience. Kidney Int 2004;66(4):1613–21. 12. Liano F, Pascual J. Epidemiology of acute renal failure: a prospective, multicenter, community-based study. Kidney Int 1996;50(3):811–8. Dr Oates has received a travel grant from Alexion Pharmaceuticals. Dr Moochhala has received speaker fees from Shire and Genzyme and a travel grant from Shire.